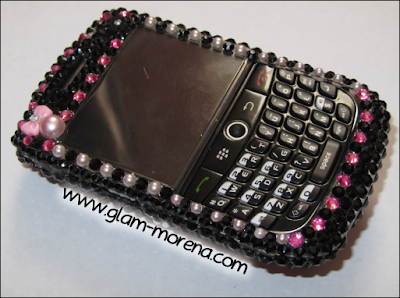 Glam Morena: Review: MeBlingBling Phone Case. Last month I got an opportunity to receive a phone case from MeBlingBling.com and they offer blinged out phone cases and iPad cases. Of course I was extremely excited because I've always wanted a blingy phone case! They are handcrafted with a mixture of Swarovski crystal and high quality crystals. They can take up to 1-3 weeks to create, ship, and arrive. The phone cases retail for $79.99. You are able to make a special request to the case for an additional $5.00 charge. My MyBlingBling phone case design is B104. Click here to view or purchase. 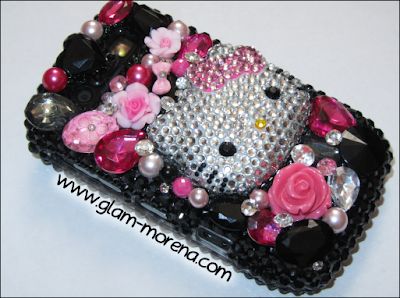 Be sure to watch the video to learn how you could possibly win blinged out phone case! Are you a fan of blinged out phone cases? She's a beauty!! I've been wanting a fancy case for my phone for a while now. It looks so feminine and girly! Your phone looks exactly like mine, I have a Blackberry 8900 and i'm tired of it because i've had it for almost 2yrs. OMGsh that's such a cute phone case! Great review! I do own a bling case from blingshield but I dont use it everyday, I think its too much and its huge ahaha.